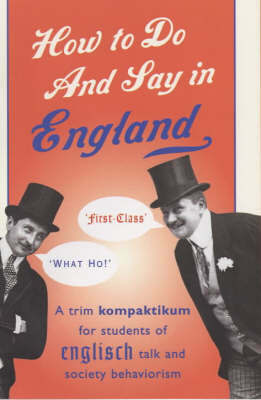 Originally published in the 1930s and long forgotten, this is a spoof foreign tourist guide on how to speak and behave in England. Following in the tradition of Daisy Ashford and Mr Chomondley-Warner, our "German" author concocts model Englishmen Lord Smith, Lord Robinson and Viscount Brown to demonstrate to eager students just how to "get along quite first-hole with the Bestcircles of Lords and Miladys". Topics of study include society, sport, love, humour, animals, London, the countryside and birthdays. Each lesson includes sample conversation pieces between Smith, Robinson and Brown at large in society.